BauHouse Group is moving forward with plans to build a 900-foot tower in Sutton Place, despite fierce opposition from neighbors. MIDTOWN EAST — A developer is set to begin demolishing buildings in Sutton Place to make way for a 900-foot skyscraper, but opponents of the project aren’t giving up quite yet. Developer Bauhouse Group announced plans this week to begin demolishing 428-432 E. 58th St., part of the area parcel of land and air rights the firm assembled over the past year. But the demolition of those buildings will not stop efforts to preempt the tower with a height limit rezoning, according to Councilman Ben Kallos, who has worked with neighbors to fight the project. Despite opposition from residents and local politicians, a representative of Bauhouse cheered the approval of the permits in a statement. Bauhouse bought up properties in January for $32 million, and in August the firm finished assembling the air rights necessary for the project, shelling out $37.9 million for the air rights from several nearby properties. It has been reported by other outlets that Bauhouse Group plans to demolish 426 E. 58th St., but the firm only owns the air rights to that property, and the building is safe from demolition for now, according to a spokeswoman for the firm. The city approved all three demolition permits by the end of September, but the developer is only now moving forward with knocking down the buildings. Residents of Sutton Place have fought the project fiercely, organizing protests against the tower and claiming to have raised hundreds of thousands of dollars to fund a rezoning of the area that would impose a height limit on new buildings in the neighborhood. Local politicians and members of the East River 50s Alliance, a community group that coalesced around the effort, said the hope was to launch the rezoning process before Bauhouse Group could begin working. 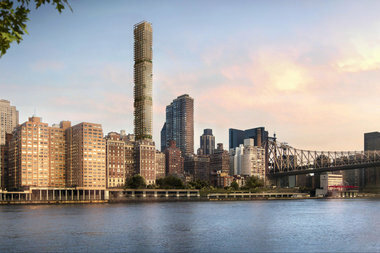 Representatives of the East River 50s Alliance did not immediately respond to a request for comment on the latest developments at the site.